One of the options to think of when you are budgeting for a shipping container is a location in mind for delivery. The site needs to be established and levelled, but before this you need to think about the most suitable and cost-effective mode of transport for your site. 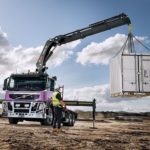 The most common forms of transport you will find to deliver your container are either a tilt tray delivery or a side loader delivery, and the choice will depend on a few factors, including your site, your budget and the type of container purchased. The truck will either drive or reverse into position. The tray of the truck will lift up them slide back (similar to a tip truck) until the back corner of the container is on the ground. As the truck drives forward the container remains stationary. The container slides down the tray of the truck as it drives forward until it is clear from under the container. A semi trailer tilt tray can often deliver/pick up 1 x 40’ container or 2 x 20’ containers at once in the same manner. This method of delivery is best suited where there is limited space in front or behind where the container is to be located. The container is offloaded onto the ground on the drivers’ side of the vehicle. When the container is unloaded it lands between the two out rigger feet of the side loader, parallel to and approximately half a meter from the side of the truck. This delivery method uses a truck mounted crane. 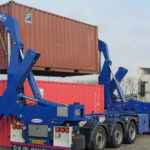 Some vehicles have the crane mounted on the rear, some vehicles have the crane mounted just behind the cab, but for container deliveries it is best to use rear mounted. 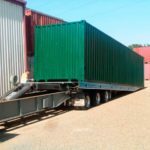 This method is best suited where there is limited space in front or behind the truck where the container is to be located. It is also the best way to position a container at an angle to the delivery truck (e.g. 90 º, 45°, etc. See picture 3 & 4) or up on a platform/raised area, over colourbond/chain wire fences etc. The truck can off load the container to either side or the rear of the truck.